Welcome to Cakes by Nicolle! Cakes by Nicolle is a cake studio located in Manhattan, New York specializing in delicious and fanciful wedding cakes and special occasion cakes. All cakes are baked from scratch using only high quality ingredients. 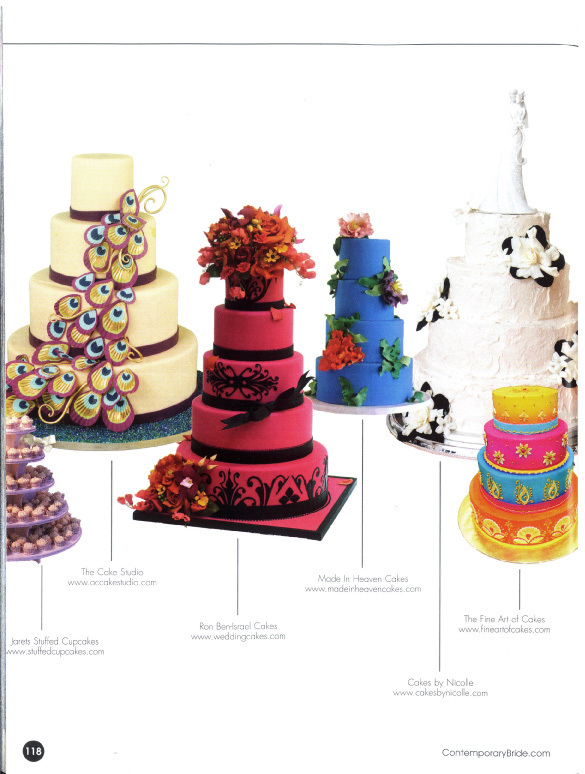 Cakes by Nicolle has had the opportunity to be featured in many bridal publications. What an honor indeed! Latina’s Magazine 15th Anniversary Celebration. Spring Edition featuring Cakes by Nicolle “spackle” wedding cake design. 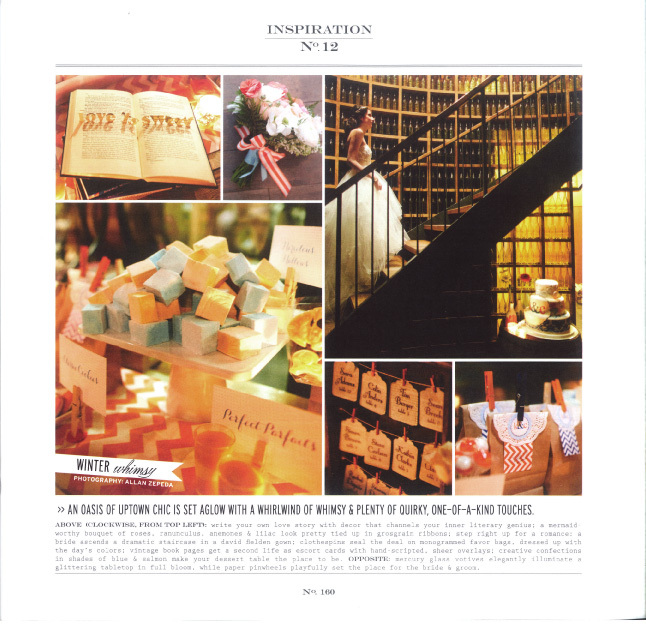 Winter Edition featuring a custom designed wedding cake for a styled photoshoot in a wine cellar. Thank you for stopping by! My name is Nicolle Lugo and I am chef/owner of Cakes by Nicolle. I have been in business since 2010 creating beautiful and tasty cakes for all occasions. Growing up in my household no one was really into baking so I found myself at an early age diving into cookbooks and anything related to baking. Waking up early on the weekends to catch Julia Child’s show instead of cartoons was the norm for me. I was rather obsessed and managed to gather a vast collection of baking recipes in hopes to one day be able to use the oven. Eventually my parents gave me some freedom and I slowly started to follow recipes and learn on my own. My passion for baking truly set in back when I was in high school working at a popular Italian pastry shop in my hometown of Greenwich, CT. Here is where I learned the hard work of the service industry and gained the hands on experience with baking and cake decorating. To any other high schooler this was just another part-time job, not for me. The pastry shop was a special place for me because it helped fuel my desire to keep learning and growing. I took a lot of detours before I made my way back into the kitchen. Along the way I graduated from college with business degree, I gained close to 15 years experience in resteraunt management & operations with 5 of those years stemming from events and catering. I obvsiously loved working in the back of house but I kept putting off the enevitable. In 2009 I made the leap of faith and enrolled at the prestigious Institute of Culinary Education (ICE) here in New York City and graduated the following year with a diploma in Baking & Pastry Arts. During my time at ICE I was very fortunate to learn and be mentored by a few of the best in the industry, specifically Ruth Drennan of Ruth Drennan Cakes. With a lot of encouragement from Ruth and from my supportive family I launched Cakes by Nicolle in May of 2010. As you can see baking and designing cakes is my labor of love. It is a testament to all myhard work, sacrifice and passion that I have for this craft. It is my honor to work with you to design a beautiful sweet creation that will be as unique and as memorable as your special day. Consultations are by appointment only as our kitchen studio is not open to the public.